Wire-free cameras make Arlo the most flexible surveillance kit around, but beware of battery life and camera range issues. Monitoring your home premises has become a lot easier in recent years. Faster broadband connections and improvements in wireless router technology have made internet-based security solutions like Netgear's Arlo Smart Home Security System easier to setup and much more reliable. Arlo joins a number of other wire-free home security devices like the Dropcam Pro, Closeli Simplicam and Belkin NetCam HD. While it doesn't pack any Minority Report-style features like facial recognition, its cameras are waterproof, meaning they're just as comfortable at the bottom of the garden as they are in the living room. They're flexible too. If you don't want to stand them upright, various mounts are available for affixing them to walls, tree branches or other hard-to-reach areas. Unfortunately you can't pan or tilt cameras remotely, but Netgear says that such mounts are in development. Also bear in mind that thieves could potentially make off with cameras, so leaving them unsecured outside isn't a good idea. 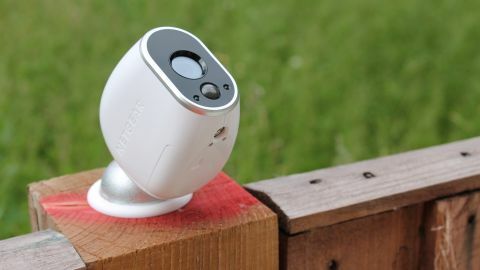 Another drawback is that, unlike fixed-position video camera systems that are permanently connected to a power source, Arlo's cameras are battery-operated using CR123 lithium batteries. The batteries aren't your typical AAA fare - they're capable of lasting between three and six months on a single charge so long as they're not continuously capturing footage throughout the day. But they still have to be changed once depleted, which could prove a pain for maintaining multi-camera setups - particularly if every camera is placed out of reach. Securing your home isn't the only use for Arlo. You can view live footage being streamed from cameras in real-time using a web portal, Android or iOS app whether in or out of the home. It effectively doubles up as a handy surveillance monitor for checking on children, pets or anything else you want to keep an eye on. Unfortunately Arlo's cameras can't capture audio, so it's video-only. Netgear offers three Arlo Security System packs that come with one, two or three cameras. Once you've chosen, you can pick from three price plans for cloud strage, which starts with a free basic package that comes with basic tech support and lets you use one base station with up to five cameras. A base station can work with with up to 15 cameras on a technical level, but you'll only be able to activate so many depending on the price plan you're signed up to. If you intend to use Arlo to capture individual incidents (rather than log hours of footage like you would with a camcorder), the basic package's 1GB of cloud storage, which lets you capture up to seven days of records, should suffice. You can either set the camera to stop recording once cloud storage is full, or alternatively delete clips starting with the oldest ones first. The premier package, which costs $9.99/month or $99/year (currently £6.49/month or £64/year) includes unlimited phone-based technical support and lets you use one base station with up to 10 cameras. This package ups cloud storage space to 10GB , which Netgear reckons is enough for up to 30 days of recordings. By subscribing to the Elite package (currently $14.99/month or $149/year - £9.99/month or £99/year), which includes the same support as the premier package, you can use up to three base stations with up to 15 cameras. Cloud storage space is bumped up to 100GB, enough for 60 days of cloud recordings. Base stations contain no storage themselves but can also be used to connect external USB storage devices for saving footage locally rather than the cloud, so having three of them lets you potentially connect up to six external hard drives. Each base station has five lights along the bottom to indicator power, internet, camera sync status, ethernet and USB.